It’s really all about you. More than that, our mission is to work with you and solve your needs. It seems like many places have forgotten the most important thing in business and that is customer service. Yet, we do have a little story to tell, a (for your eyes only) peek at who we are. Our Mission is to bring change on how computer repair is done. Who doesn’t like change? Our Main Objective is to give you the best customer service out there. -Second Objective, to give you the best, honest, repair service in Houston. -Third Objective, develop a long term relationship with our customers. This dedication has allowed us to help many, over and over again. -Fourth Objective, get it right the first time and fast. We understand how important these devices are to you. Time is essential to you, as it is with us. No one wants to wait weeks to get there computer back. You might be asking yourself, ok I know what your objectives are but who are you? Well, we here at TopSecret have many years’ experience in the repair industry. We come from professional backgrounds working, Retail, IT, Repair Centers, and Military. Our business all started by looking at the gaps that are present in the current repair industry in Houston, TX. Many which have to do with our Objectives. It is hard to find a place for repair that is dependable and honest. We have learned what NOT to do in our experience working in retail repair shops. We find ourselves fixing the many mistakes these other repair businesses make. We strive to give you the best customer service like no other and we stand 100% behind our work. Our mission is never complete if you are not completely satisfied. Please let us know if we can help you in any way, we are always standing by ready for a new Mission. 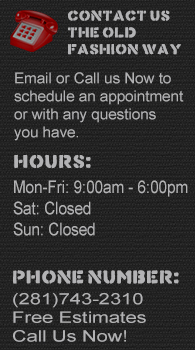 Click Here to visit our services page to see what we offer or Click Here to contact us. . When my computer broke last week, I didn't know where to go. By chance, a friend suggested Top Secret Techs. I gave them a call and spoke with Jose & Robert. They were very friendly and got me a reasonable quote right-away. They were able to fix my computer the very same day, I dropped it off in the morning and picked it up the same evening! - Travis H.